This foundation has been formed to provide hope and direction to families with special children dealing with heart defects, cancer and other life-threatening illnesses. Our goal is to provide assistance to these families in times of need. Miracle Kids are welcome to participate in the Max's Market giveaways, get tickets to entertainment events, and are welcome to enjoy the Ranch, train, critters, and play areas anytime! We also offer emotional and financial support to our Miracle Families. If you are a Miracle Family in need of help, please print and complete our Confidential Enrollment form, Release of Liability, and Media, Photo & Video Release forms below. please call us at 530-354-7168 or write info@maxsmiracles.org and we'll send the forms to you. 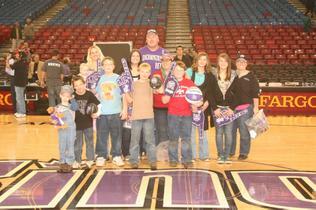 Max and the kids of Max's Miracles were invited to be the guests of the Sacramento Kings against the Miami Heat. Our group of fifty miracle kids and their families had a terrific evening at the game. We would like to thank the Sacramento Kings Organization and Ivette Gonzalez for making Max's first Kings game so special. 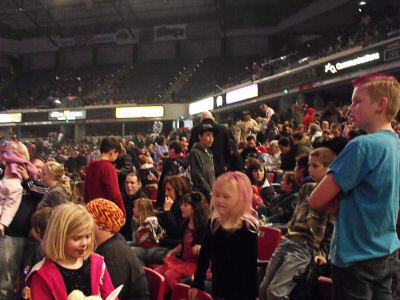 Many thanks for tickets to Disney on Ice for the Miracle kids and their families in February 2011.